Called "Schnozz" because of his enormous nose, Lombardi was a slow, awkward-looking catcher who could hit a ton. He surpassed the .300 mark 10 times. 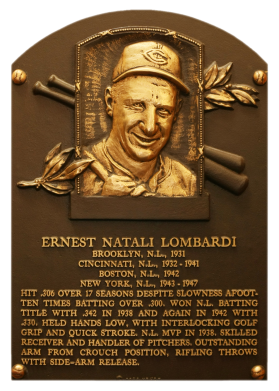 In 1938, his league-leading .32 averages with Cincinnati earned him the NL MPV Award. 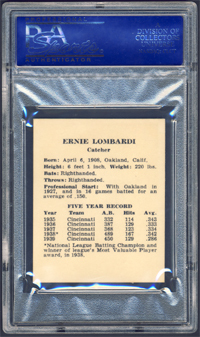 Five years later with the Braves, Lombardi again led the league with a .330 average, becoming the only catcher to do so twice. 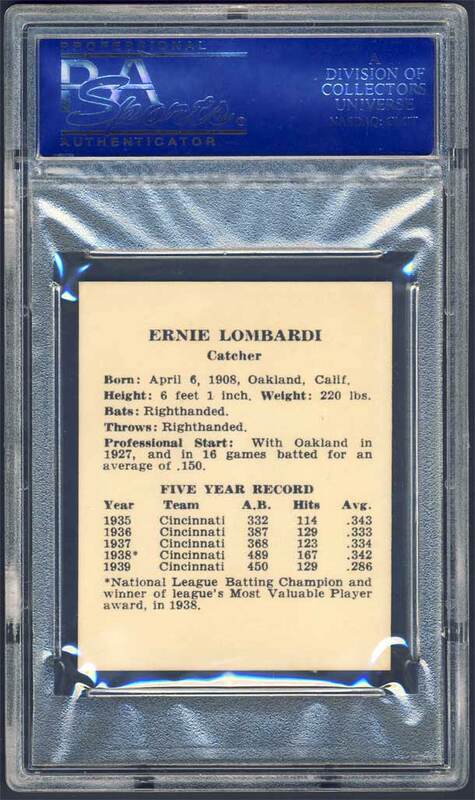 He had a career .306 batting average and 990 RBI. Comments: In April, 2003 I found what I thought would be the perfect portrait of Schnozz - a raw 1947 Tip Top Bread card on eBay. I won the auction. In August I picked up another raw example. The cards were submitted to PSA and came back graded PR-FR 1 and GOOD 2. After settling on Doerr for the '47 Bread set I looked for a replacement and found one. 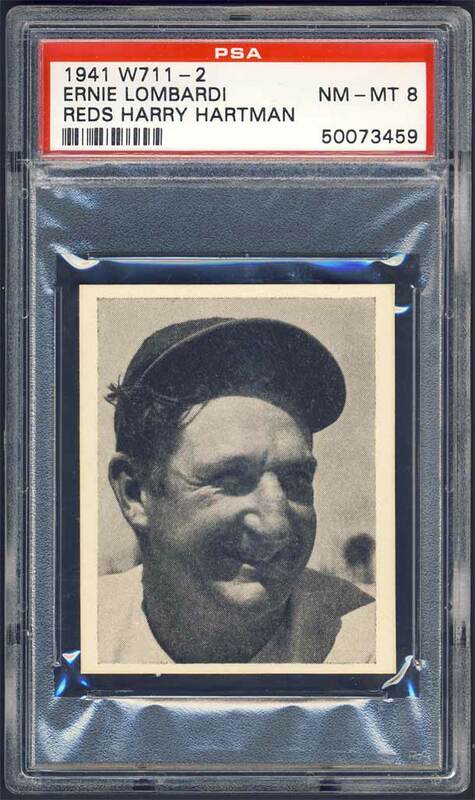 I won a raw EX-MT 1940 W711-2 card in February, 2005 on eBay from Larry Fritsch Cards. The card was submitted to PSA and came back graded 8 (OC) the following month. In February, 2008 a very good friend, Anthony Nex, sold me this beautiful upgrade - a straight eight. He gave me a great deal too - thanks buddy! Description: Another early Reds team issue, this set of black-and-white 2-1/8" X 2-5/8" cards is unnumbered and features player portrait photos on the front. Name, position, biographical information and five years' worth of stats are on the back. The Reds were World Champions in 1940 (defeating Detroit), and the set features several special World Series cards, makiing it one of the first to feature events as well as individuals.